AirPhil Express re-opens its “Ahhh…the Perks of Summer” Express sale for domestic destinations with January 10 to March 31, 2012 travel period. This sale features flights from Manila and Cebu with prices that start at Php 188. This travel period also covers the Sinulog and Bacolaodiat Festival in Cebu and Bacolod City respectively. Likewise, top tourism destinations like Bohol and Puerto Prinsesa is also included in the seat sale. Check out details below for more information. 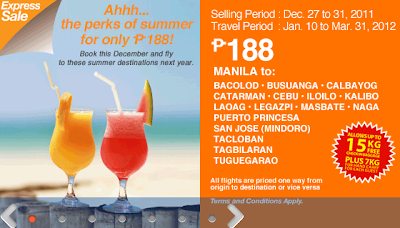 Travel Period is January 10 to March 31, 2012 and Express Sale is up until December 31, 2011 or until seats last.